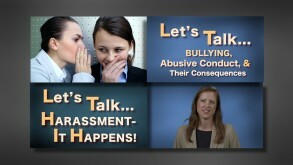 3 DVD series that covers Workplace Bullying, Workplace Harassment & Sexual Harassment. Workplace bullying is not a new problem, but only just recently has the plague of bullying at work been quantified. Conservative estimates put the loss in productivity at over a billion dollars in the USA alone. Decline in employee morale, loss in productivity, employee turnover, health problems and loss in organizational reputation are just a few of the problems that the bullying causes.